My art is clutter free, so my studio must reflect that. Two simple tables in front of windows that drown the studio with natural light. Taking breaks to look out into the forest gives me renewed focus. Two daily walks into that forest that speaks humbles me. 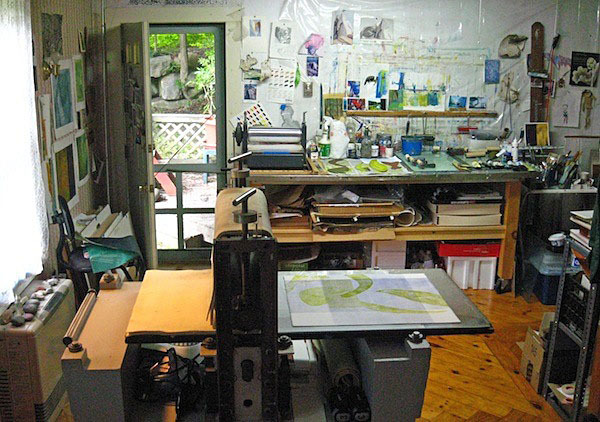 People who visit my house for the first time are surprised to walk into a large, open, busy room, my combined kitchen/printing studio. A large press makes an informal divider between the two. My studio was once a dining room (little used) so I turned it into something more pertinent to my life. This really works for me since I can sit at my kitchen table to study my work and immediately turn around and be in the studio…no excuses. The best thing I did for my work was to buy a press. First, I saved up and got a baby press and then, a month or two later, the large press came on the market and I bought it too. Before I owned a press I was trying to print monotypes on the kitchen table with a marble rolling pin. It sort of worked but boy, that press sure makes a difference in my prints. In addition to plein air studies at various places along the coast, a large part of my practice is devoted to working from the model, alongside other figurative artists, in two weekly life drawing groups. The studio is where these elements — the faces of the models, the light and sky reflected in water, and a vast array of wildlife — are all combined to form what will hopefully be a coherent, believable, if somewhat unlikely, composition. 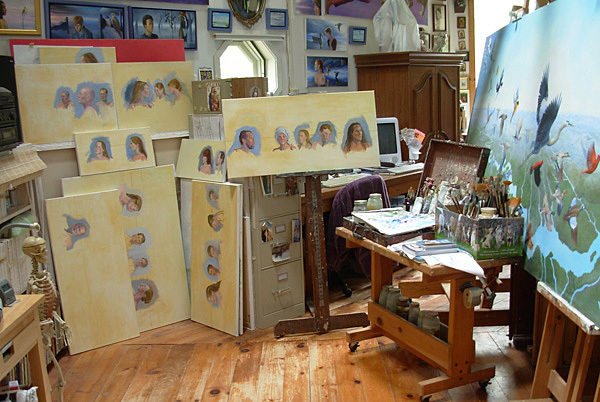 On the right is a 12 x 4 foot panel in progress, a section of a mural for the Mount Blue Learning Center, part of the Percent for Arts Program of the Maine Arts Commission. 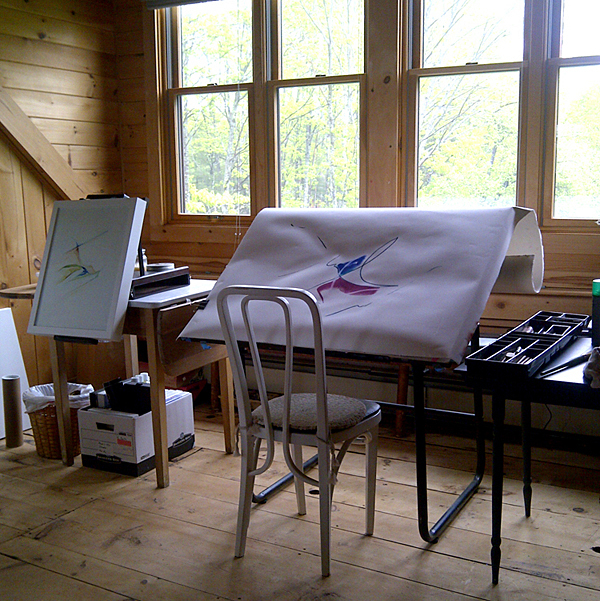 My studio is in the house we built ourselves over 20 years ago, surrounded by woods and wildlife that I often photograph. As the years have passed, the boundaries of the studio have dissolved and it seems like most of the house is now the studio.